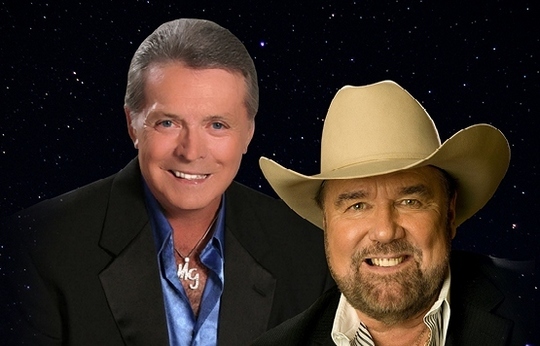 The Urban Cowboy 35th Anniversary Tour featuring Mickey Gilley and Johnny Lee will stop at Don’s Celebrity Theatre inside the Riverside Resort April 10-14 with 8 p.m. performances. Tickets are $38. 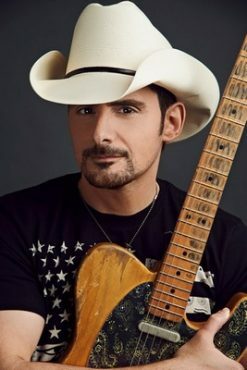 Country music superstar Brad Paisley will headline the outdoor Laughlin Event Center on Saturday, April 13 at 8 p.m. Tickets start at $60. His Laughlin visit will come before he kicks off his 2019 World Tour on May 30 with special guests Platinum-selling hitmaker Chris Lane and rising singer-songwriter Riley Green. In addition to singing and playing guitar, Paisley has written 21 of his 24 No. 1 hits and accumulated more than 20 million career total worldwide album sales, track downloads and streaming equivalents. His talents have earned him many awards, including three Grammys, two American Music Awards, 14 Academy of Country Music Awards and 14 Country Music Association Awards including Entertainer of the Year. Since 2001, he has been a proud member of the Grand Ole Opry. Paisley’s 11th studio album, “Love And War,” which was released April 21, 2017, was his ninth consecutive studio album to debut No. 1 on Billboard’s Top Country Albums chart. Sammy Hagar’s Full Circle Jam Tour will appear in concert at the Rio Vista Outdoor Amphitheater at Harrah’s on Friday, April 26 at 9 p.m. 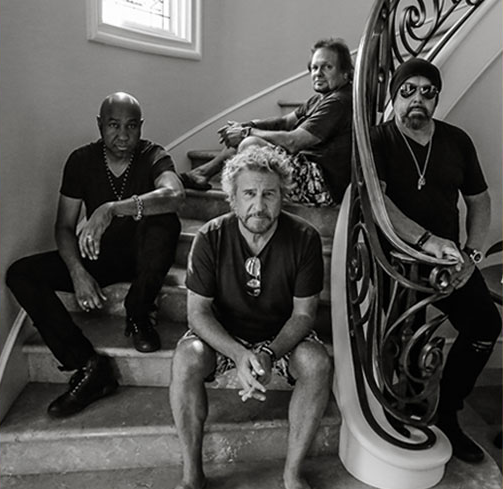 Comprising the supergroup are Rock and Roll Hall of Fame inductees Sammy Hagar, bassist Michael Anthony, drummer Jason Bonham and guitarist Vic Johnson. The group is supporting their new album “Space Between.” Tickets start at $82.33. Formed in 2014, the acclaimed supergroup quickly established themselves as one of the most exciting live acts covering career-spanning hits from Led Zeppelin, Van Halen, Montrose, and Sammy Hagar and The Waboritas. Hagar, also known as The Red Rocker, came to prominence in the 1970s with the hard rock band Montrose. He launched a successful solo career with the enduring 1984 hit “I Can’t Drive 55” and enjoyed commercial success when he replaced David Lee Roth as Van Halen’s lead singer in 1985; but left in 1996. Hagar joined the band again for a two-year reunion 2003-2005. On April weekends, Friday-Sunday, two comedians are paired for shows in the Edgewater’s “Comedy on the Edge” shows at 7 p.m. Tickets are $15 and U.S. veterans are eligible for a $2 discount on Sundays. Luis Villaseñor will share the stage with Greg Henderson April 12-14. Villaseñor was hooked to stand-up from his first time on stage at the Irvine Improv. For the past 12-plus years, he has been entertaining audiences with jokes about family, personal anecdotes and observations about daily events. Ron Feingold will appear with Julian Fernandez April 19-21. Twenty-five-year comedy veteran Feingold combines stand-up and a cappella music, performing and recording his vocals live onstage. His material combines relationship humor about wife and kids and impressions within songs in the show. This is the side that Laughlin residents call home. Needles Highway is a direct route between Laughlin SR163 (Laughlin Highway) in Nevada and the California state line which is just past AVI Hotel and Casino property. If you are coming from the west on SR163 you will come to Needles Highway before you get to Casino Drive. Coming from the east from Bullhead City, Arizona, you will go over the bridge, pass Casino Drive, pass Thomas Edison Drive, pass Laughlin Civic Drive, and pass the Davis Dam road before turning left (south) on Needles Highway. As you traverse this highway you will notice it does not have a lot of stoplights. As a matter of fact, from SR163 to AVI’s second entrance at the California border there are only 2 stoplights, at El Mirage Way (by Laughlin Town Center) and at Casino Drive (by Gilligan’s). From SR163 traveling south, the first building on your left on Needles Highway is the Mountain View Park and Spirit Mountain Activity Center, which is on the side road, Arie Avenue. This area is part of Clark County Parks & Recreation. They have outside tennis courts, a basketball court, playground, shaded areas, baseball fields, skateboard area, dog run, and a volleyball court in the Park. The Activity Center includes the Boys & Girls Club and Senior Center with numerous activities and trips planned all year long. About a mile south of the Activity Center is the Laughlin Library on Las Palmas Lane. This is the largest rural library in Clark County and operated by Las Vegas and the Clark County Library District. If you are on this side of Laughlin taking Needles Highway to California and need computer access, this is a great place to stop since they have a fully accessible area with computers, printers, internet access for your use, as well as wireless internet access. Stop in and recharge your batteries! As you can see, there are a lot of government buildings located in a mile area and all on the same side of the street. Besides the Park and Library, the Post Office is just past the Library in the next building on the same side of the street. At the stoplight entrance into Laughlin Town Center is a Nevada DMV location. This DMV is very small, with next-in-line numbers to pick from a board and with four rows of seats. There are only two desks to accommodate the customers, so it can take a while to get waited on, especially on a Monday. Just ask me. I’ve been there a few times. In this shopping center, besides the DMV, you will find a gas station, grocery store, numerous small businesses, and a few places to eat. The center is worth stopping at if you need to pick up a few things or are hungry, passing by and not planning on going to the Laughlin Strip. Mama’s Pizzeria is pretty good, although not the best pizza in town. They occasionally have specials on their in-dining, carry-out and delivery of their different size pizzas, wings and sandwiches. They have daily lunch specials with an everyday pepperoni pizza special. Humberto’s Mexican Food gets the stars, in my opinion. Although this place is small and unassuming, the food is delicious and authentic Mexican. They pack their burritos with meat instead of the usual beans or rice. 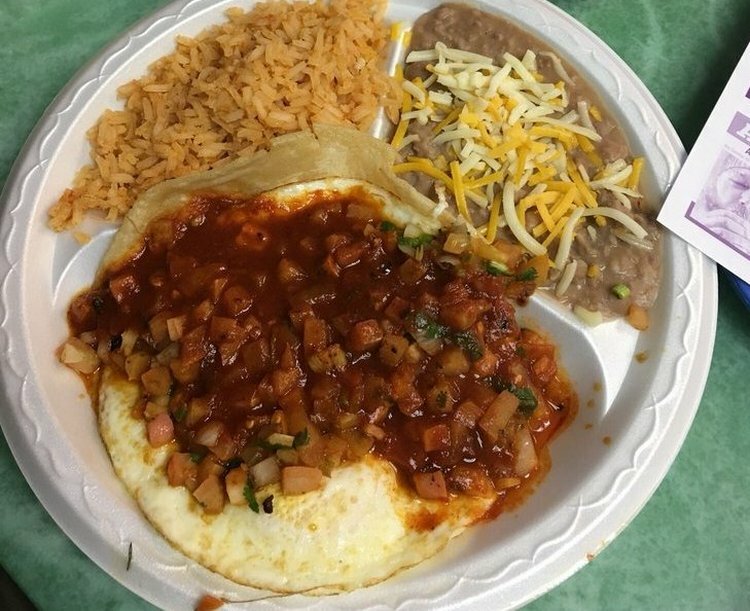 Their Menudo and breakfast burrito are outstanding. And the portions are large and tasty. They have a dozen variations of burritos, tacos and combo plates, tortas, carne asada nachos, and specials. They also have beer specials. 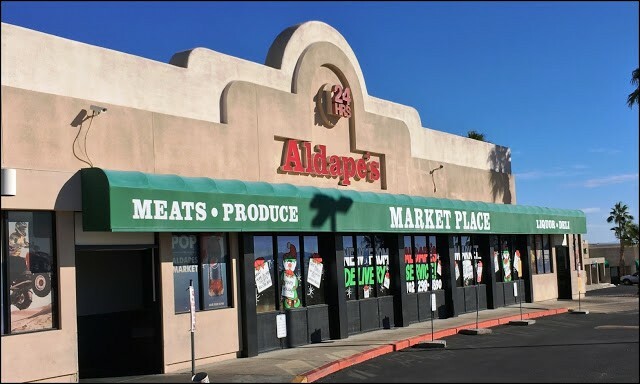 Aldape’s Market Place is a grocery store which is the closest the residents on this side of town have without traveling to Bullhead City, Arizona. Luckily, it is well stocked with something for everyone and open 24/7. They have a deli which is not open on Sundays; however, it is open at 5 a.m. until 7 p.m. the remainder of the days. If you miss this area the next possible stop for gas and food is a few miles down on the right (west) side of the road at James A Bilbray Parkway where you will find the South Pointe Market. This is the requisite gas station and convenience mini-mart. They have Krispy Kremes fresh daily, along with a beverage area, liquor and video poker machines. If you were to go east (left) at James A. Bilbray Parkway from Needles Highway you would arrive at the Laughlin Community Aquatic Center, which is 2 blocks from Needles Highway and also part of Clark County Parks & Recreation. Daily admission is $1.00 for ages 3 through 17 yrs. and 55 yrs. and older. It is $2.00 for ages 21 through 54 yrs. There are season passes available, if interested. 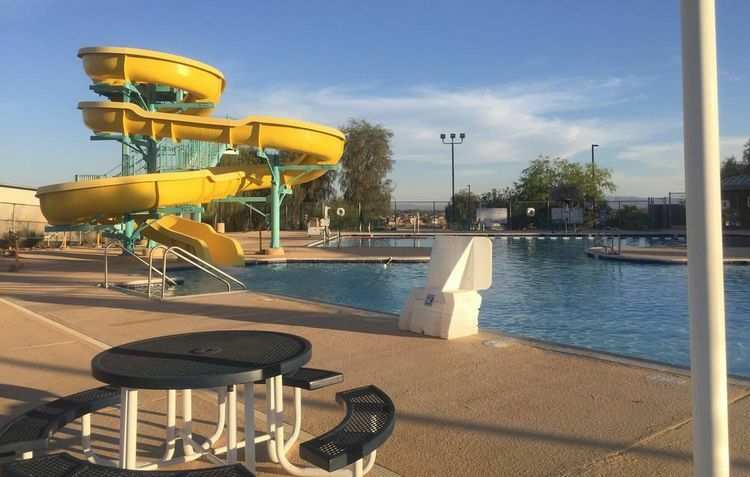 The normal open swim hours are Tuesday through Friday from 2 p.m. until 6 p.m. and Saturday and Sunday, 1 p.m. until 7 p.m. The open swim is closed on Monday. The reason for the open swim restrictions is because of swimming, lifesaving and swim team classes. There are locker rooms, shaded tables and a large water park slide for all to enjoy during the summer months.